Every four months I make a 5 hour round trip to Vanderbilt to see my kidney Doctor. My mom and I had transplants a year apart with the same doctor, so we coordinate our appointments. The day before (today) often requires a lot of planning and reminders, so this method of planning works well for me. The tasks I need to complete for tomorrow are listed on the left-hand side of the page. Can you tell I want to remember not to take my Prograf!? I've written it in a couple of places. I have also noted, more than once, a reminder about lab procedures. I don't want to forget. The time schedule on this page will be used tomorrow. I'm keeping up with my mom's appointment, as well as 3 of my own. At the bottom of the schedule, I've written down questions I want to ask my doctor. 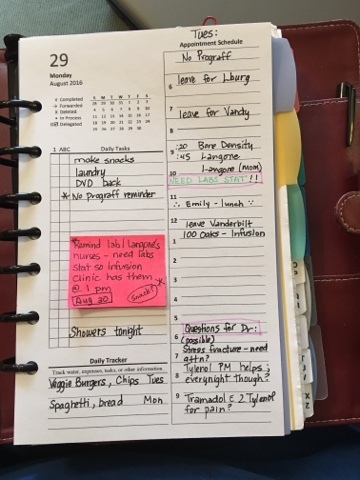 If there's one thing I've learned from Kristy at Giftie Etcetera, it's that you can use planner pages however works best for you - two days on one daily page works great for me in this situation. Do you do anything similar with your planner pages? Looks like a great way to deal with busier than usual days!! I see you have pre-dated pages. Will you end up rewriting this schedule on Tuesday or just skip that page in your planner? I actually just used the same page on Tuesday. I don't use a daily page every day so it worked out well. I also edit the date and print out the pages when I need them. Thank you for your explanation of your daily page for 2 days. I'm also a transplant recipient. I've have had my transplant 12/15/1997.